SoChlor DST Detergent Sanitising Tablets are effervescent detergent sanitising tablets used for terminal, outbreak and isolation cleans and general environmental cleaning and disinfection. SoChlor DST combines the traditional clean - rinse - disinfect processes into a single operation, saving time and money. Most detergents are alkali based and prevent chlorine from working properly. 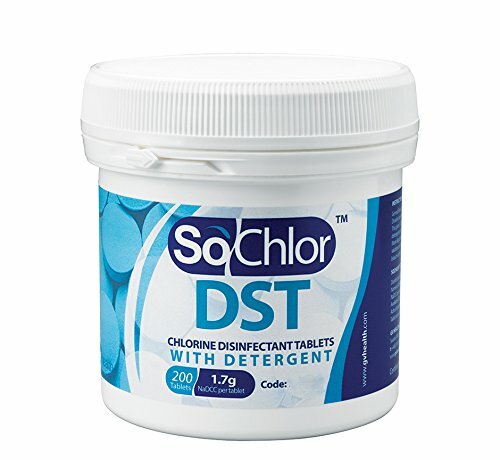 SoChlor DST tablets combine chlorine with an anionic surfactant (acid based cleaning agent) meaning the chlorine continues to work effectively. Used at the specified dilution level, Detergent Sanitising Tablets deliver a chlorine solution of 1,000 ppm as required by the Department of Health and the Health Protection Agency.